A new Horse racing themed TV has gone live on-line showing a range of channels. www.jockeytv.net includes programmes that look into the behind the scenes life of a Jockey and a fashion programme featuring Australian based Fashion Consultants, Izziana Image Plus, regular fashion debate and chats with Camilla Henderson. According to the Channel ” jockey tv – will seek to travel round the UK visiting, racecourses, yards, Polo matches, Eventing meets and all equine sport. We’ll seek to capture the essence of what being involved in equine sport is about. Not just race riding for jockeys, or riding for Eventers, but also finding out what make these intrepid folk tick. There’ll also be fashion elements, artistic contributions from Newmarket artist, Suzie Jones and much more. Plus, some poetic equine verse from the talented Henry Birtles. 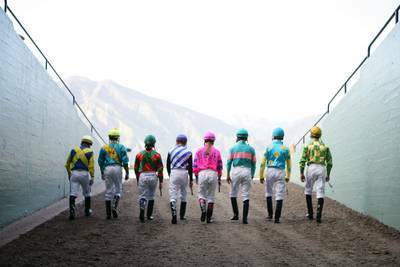 Make sure you add Jockey TV to your favourites as we’ll keep the content fresh and innovative.